Inshore anglers who love to use live bait will certainly want to get their hands on the latest addition to Penn's popular Slammer series reels, the Slammer Live Liner. In addition to having the same top-quality features as the original Slammer series reels, the Slammer Live Liner Reels feature a secondary rear drag and automatic engaging live-lining trip. "Of the three live liner style reels I've tried, I only kept the Penn. Awesome reel (560L). Definitely tops for baitfishing, and I love that you can easily yank out one part to eliminate the auto-trip feature (I'd rather trip the drag manually)." "I'm very upset with this reel !! 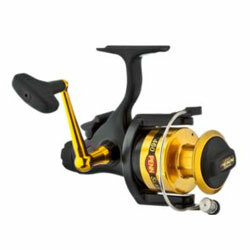 i bought this reel the 560 model no longer then 2 months ago. i fished with this reel 3 times...and the live liner is already broken ! when its on and i try to crank the reel for the main drag to kick in and it never does! " "The Penn Live Liner is perfect for fisherman who use both live and cut bait. For years, I've frantically increased my drag setting on conventional reels to set the hook after the initial bite takes place."